Rebuilding Place in the Urban Space: Brief comment on e-scooters: "personal mobility" versus "mass mobility" versus "mass transit"
Brief comment on e-scooters: "personal mobility" versus "mass mobility" versus "mass transit"
I'd be curious on your response to Alon Levy's point as well that transit rich cities can afford to do bikeshare scooter as a last mile, but it isn't a substitute for transit. I haven't read Alon Levy's post. In these kinds of discussions often people mistake personal mobility vehicles, and by personal I mean a vehicle that can only move one person, or maybe 2-4 people at a time -- cars, scooters, bikes-- for "transit," when what they really mean is individual transportation versus moving large numbers of people at once, to wit, "mass transit" which moves large numbers of people at the same time on the same vehicles, e.g. bus, light rail, streetcar, train, etc. WRT Alon's point, it depends on the trip. As we were discussing recently, with increased density and higher income residents more amenities become present over shorter distances, reaching a kind of critical mass capability of negating the need to travel farther, maybe negating the need to use mass transit. Instead you can substitute by walking, biking, scootering, or delivery. This likely is influencing the decline of Metrorail ridership in Metrorail's theoretically best markets of DC and along the Rosslyn-Ballston corridor in Arlington County. Mass mobility versus mass transit. Definitionally, there's a difference between the term "mass mobility" versus "mass transit." And we should think about this. I don't think I've used this term before. I haven't coined it but there aren't many examples of its usage if you do a Google search, but there are some, and interesting ones at that. What I mean is moving a lot of people at the same time but not by car and not by transit--specifically walking or biking, what are sometimes called "nonmotorized transportation." Think lots of people walking in New York City or London or Paris or Tokyo, Chinese cities, etc. World's busiest pedestrian crossing - Large panorama of the Shibuya Crossing, Tokyo. 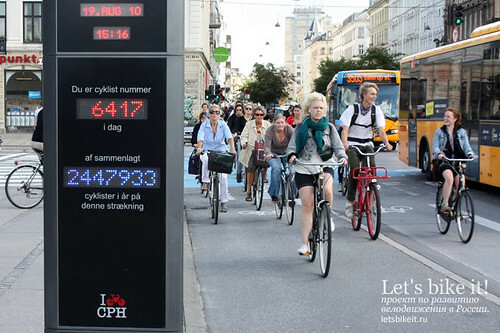 Or in Amsterdam or Copenhagen the large number of bicyclists, where in an average day they have have mode splits up to 40% of people traveling by bike for a wide variety of short, medium, and longer distance trips. That's definitely mass mobility. But it's not transit. And there it does substitute for "local transit." 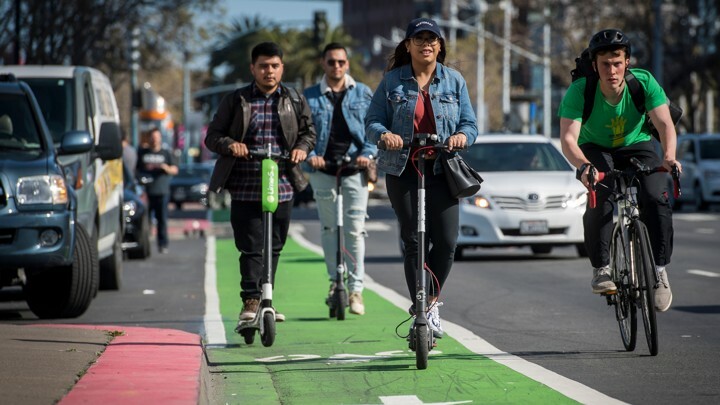 Are e-scooters capable of being "mass mobility"? In DC, theoretically, I can see personal mobility -- walking, scooters, biking, e-biking -- having the potential of accomplishing 30% or more of certain kinds of trips, but not for longer distance trips normally undertaken on transit. A majority of trips in the US are three miles or less. Remember that in the US, 51% of trips are 3 miles or less, and another 13% are 3-5 miles. A significant number of those trips can be accomplished by personal mobility modes that are also sustainable (walking, biking, scooter, one-way car share). In short, it's complicated. Yes, I agree with Alon's point generally. Scooters complement but don't substitute for transit. 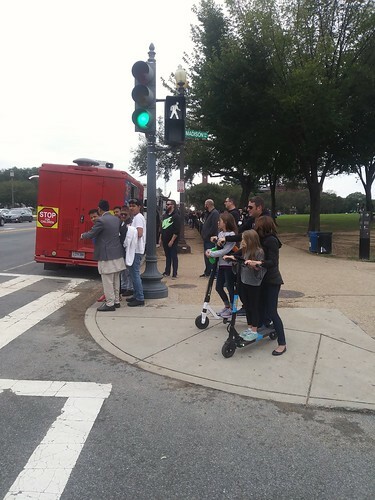 But last mile/first mile as an element of transit trips is probably not the primary segment of users for e-scooters. This is the case for bike share too. It appears that the primary users of transit in DC are nonresidents, using transit to get to and from work. Either their station is pretty close to their final destination and walking suffices, or they are not knowledgeable about complementary bike and scooter share options, and unlikely to use them. This is different from how bike share is used in Europe. Thinking about intra-district versus inter-district trips versus intra-district versus inter-district transit. Instead, in the US context, scooters are (1) more likely to be used in "walking and transit cities" ("Transportation and Urban Form: Stages in the Spatial Evolution of the American Metropolis," Peter Muller>) rather than in suburban and spread out cities. (2) These are likely what we would call "intra-district" trips and relevant concepts are my old mobility shed concept and intra-district mobility, which I had applied to thinking about transit modes, but not so much for walking/biking/scooters/e-bikes for intra-district trips starting and ending within the district. Not "Talking About Revolution. "Just as I don't believe Autonomous Vehicles will save the world either because even if it gets used more, and remember 50% of the time ride hailing vehicles are in use they are empty, it's still using a car to move people around in a congested place with constraints on road space, I don't think scooters will do much except on the margins. E-scooters are evolutionary not revolutionary, because they substitute or complement a narrow range of trips. Unless DC is an outlier. It's not like you see dozens of people on scooters at one time in what I am now calling an example of "mass mobility." I've seen maybe 5-6 scooters in use at one time. And that's then, 6 people... and in the great scheme of things, that has little impact, although tremendous impact for the users. 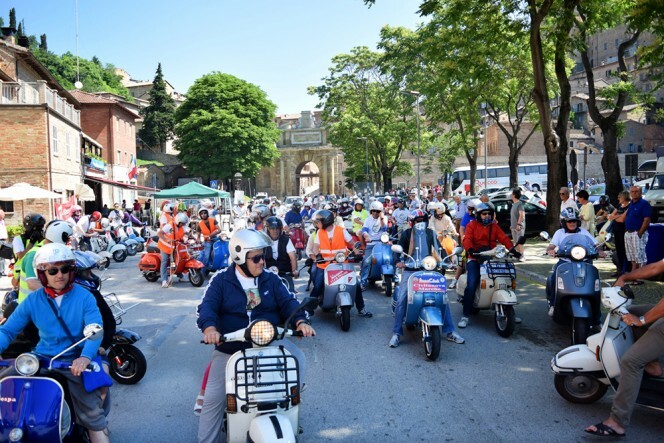 Photo from a Vespa rally in Urbino. Photo: Urbino Project. Two-wheeled sitting scooters as mass mobility: in Italy. Now that we have standing e-scooters, I guess we can call the Vespa type scooters "sitting scooters." They are more a substitute for cars, especially in Mediterranean climates. 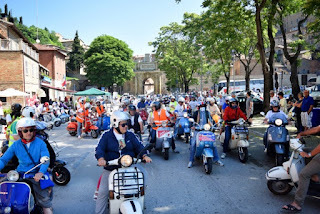 According to the Daily Telegraph article, "Ban on Vespas in Italian city has scooters riders in revolt," there are 180,000 "sitting scooters" in Genoa, out of 600,000 people. Apparently the gasoline powered Vespa type scooters are significant sources of air pollution (like lawn mower engines). I guess we're going to have to change the term "bicycle and pedestrian planning" to "bicycle, pedestrian, and scooter planning." Hmm. There was an article about Tesla, on a research firm that argues the stock is worth tons more, because they will change automobile manufacturing and earn 40% margins, because of the power of the software. Making things is expensive and not easy and not subject to making 40% margins, unlike software, where if you're lucky, it's just downloaded so you don't have to make a disk and manual. Of course, transit and mobility doesn't have 40% margins. It costs money to deliver. The advantage of Uber etc. is that they charge an extranormal amount for using the app, so they make money theoretically even if the driver barely does. Driverless will make a difference because you have less labor. It's doable with track-based vehicles and will take a long time for trackless. But with buses it could make a nice $ difference. It reminds me of how 7-11's franchise fee wasn't a percentage of revenue, but something like 51% of net profit. And they wondered why store turnover was high in all but the most successful locations. And yes, the original idea of 3rd generation bike share (i.e., Velib) was to complement transit, as is what's happening in China. You might have sent me a link to the BI article where the dude wrote about his experience in China and how most train stations seemed to be about a 15 minute walk from the final destination. + you mentioned logistics/delivery. + I mentioned the extremely low cost, a few cents per ride. It all comes back to the "walking-transit city" form, what I call the SMP, and DC as an example of world leading MaaS. You can layer those services here because we have the urban form, relatively tight links between origin and destination, the transit as a backbone (hopefully it will get "back to great" at some point), and the various services that can be combined. But you can't blame him for the technological embrace common among the smart growthers/GGW types. Remember all those posts a few years ago about how AVs were going totally make cities over? Alon Levy is a very good writer. He is so good that sometime I realize he doesn't have anything much to say. That said, I think he brings up a good point -- how do we create a system that pours more money into infrastructure investments that only return 3% a year. gas tax, carbon tax, treatment of infrastructure as a public good, regular taxes rather than a continued reduction of tax rates for corporations and the wealthy, investment of monies/capital budgeting instead of being spendthrift with public funds, etc. E.g., in Medellin with "social urbanism," and investment in mobility (aerial trams, public escalators, etc.) and social infrastructure (libraries, parks, etc.) resulted in a significant reduction in murder rate, crime rate. You can quantify the value, but it's the kind of thing where the ROI is dissipated across all kinds of accounts and hard to wring out. It's the kind of thing, theoretically, that is made for "social impact bonds." But who thought that might have worked. The thing is that Medellin owns the electric and water utility, and they used the revenues and bonding capacity from it to fund these programs. WRT Alon's work, generally I think he's quite amazing, has written some important stuff, like reconfiguring LIRR and Metro-North to be more of an in-city service. ... maybe it's envy on my part, but I didn't think the pieces he did on DC issues for the DC Policy Center were all that... but unlike me, he got paid for writing them. Similarly, in Seattle SPU is owned by the city. Not sure if that includes electricity. But like with DC Water now, SPU pioneered investing in green infrastructure to reduce stormwater effects and costs. OTOH, conservatives attempted to put strictures on the municipal water utility in Portland for doing the same thing. And when Enron went bust, they owned Portland General Electric. Apparently there have been many times over the years to convert electricity service to a "public utility district" but for the most part these efforts failed. DOn't know if you can pull it up, the last line is priceless -- alignment of incentives. We've talked about that in terms of the Marshall plan -- yes, if we can invest an additional 3B a year into poor parts of DC and that is turn results in a net reduction in police, safety, crime, healthcare outcomes, then your incentives are aligned. As I have continued to say, DC has the fiscal capacity to build a new subway line but we choose to spend it on social services. thanks for that cite. I don't get hard copies of the FT til the following week (from someone I know). Is it a special section? It took me awhile to figure out how they worked. I've written about it some. I excoriated the draft DC Cultural Plan for suggesting "program related investment" and "social impact bonds" could be used to fund the arts. PRI is another term for loans. You need a profit to pay them off. Arts aren't profitable. SIBs have to have a positive ROI too. I didn't see how they could be a funding source for the arts. Anyway, about this. It's important to distinguish between the funding mechanism and the quality and design of the program to produce outcomes. Most programs aren't probably well designed. Irrespective of the funding source. For programs likely to have a good ROI, I'd say rehousing of "street people" and then providing various wraparound support services. Since most studies find the highest users of emergency and other services that result cost $100,000/year or more. SO it's the program and design. It's being able to capture and redirect "savings." It's the funding. The problem with financing vehicles like SIBs and to some extent "Public Private Partnerships" is that nonprofit/government people are trying to talk and act within the language of business, when it's not the right model and schema for understanding and dealing with public goods. The article is good at discussing the disconnects between the private sector and the public sector in terms of SIBs and what's potentially a good deal to put up the money for in terms of financing it. Don't know if you remember the business concept of "intrapreneurship" of being an entrepreneur within a corporation. We need innovation and flexibility. Obviously, given Weber etc. (_Bureaucracy_) governments aren't about innovation, they are about maintenance. But in a time of constrained resources, innovation and flexibility and the ability to work with constraints needs to be supported. That's hard for government. Especially if they are compelled to try to do so in the context of business models and language that aren't fully appropriate. being on what passes for a board for Eastern Market is mostly frustrating (I guess that's another "f" word). It's a civic asset. But a civic asset that has to function in the context of the economy of food sales. The city isn't positioned to be able to manage this asset the way it should be run from a business sense. The people on the board (technically, a "community advisory committee") mostly look at the issues in terms of it functioning as a civic asset and the success of the indoor merchants (a kind of regulatory capture). I'm sure the top two managers of EM get paid far more than the equivalent people at a very successful grocery store. And they don't do near as much. Well to answer your question on SIB I do think you have to factor in the incentives. But in a public urban context, the real issue is we live inn a gordian knot of externalities, and measuring them is almost impossible. So yeah, I am with you on let public services to public stuff. It isn't hard. You do have the enormous capture problem -- public unions, as you described the shops, etc. And goes back to the question Alone was posing -- how do we get more investment into things that do small returns. Muni bonds aren't cutting it. PPI isn't working either. 50 year bonds don't really work (DC Water). I've thrown up the public bank/infrastructure boards as well. Id say 75% of it is trust which is the manna of politics -- and for very good reasons we don't trust our politicians with the money. I haven't tracked down his new book yet, which was reviewed in the WSJ. although, like my complaints about ascribing Houston's success to "not having zoning" when the reality it's built on being the hq city for the oil industry, Oklahoma City is central to the oil and natural gas industry too, and that had to have a lot to do with the city's success. Then again, plenty of places in equal circumstances lack the kind of civic leadership possessed by OKC. And yes, big debt financing, but Aubrey McClendon funded a lot of good things, did reasonable architecture for his buildings, etc. What's surprising about the review/book is that it acknowledges that the key work was done by previous mayors. But yes, I'm not sure I want David Grosso or Muriel Bowser making long range decisions about infrastructure and financing. cf. my series on the United Medical Center. Although at the end of the day, they'll build a fine, functioning hospital. It's just that it could do a lot more, achieve a lot more. wrt financing, I am not smart enough to figure that out. High finance is beyond my imagination. That's more your department. BUT, with higher tax rates, tax credit programs seem to work ok, e.g., low income housing, historic preservation, New Markets, etc., and now with much lower tax rates plus changing the requirements to make them less useful, there's much less use. Again, I'm not one to figure out the specifics, but clearly community reinvestment initiatives and such found the tax credit programs attractive. However, they are for much smaller projects. You're not likely to be able to pull the funding together that way for the Purple Line or other similarly large projects. e.g. the HP tax credits for the Atlas Theater rehabilitation were $4.5MM. Norwest did the deal and loved it. How to come up with $1B for a project? Umm, difficult. + like with Eastern Market or streetcars in DC, you have other s* going on too. Mayor Bowser has no interest in giving up control of EM and scotched an effort to have a c3 run it. Under Mayor Gray, the business community led by the president of Akridge proposed a public private partnership to fund and operate streetcars with a major commitment to building out the network, and the city never really even responded to the entreaties. It's a sticky thing to intertwine with business. I suppose no city is particularly good at it (cf. Chicago's terrible parking structure and parking meter deals). But it can work in the right situation. The Portland streetcar is an example. Seattle's too.